Feathers is a Massachusetts based collective that have released a number of CDR recordings and played live shows, but this album is their first proper release (LP only). 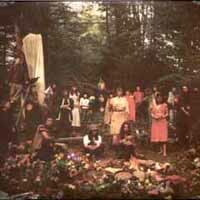 If I had to label the music I'd call it folk-psych. However, simple labels are doomed to failure in describing what Feathers is about. Theirs is a mystical and enchanting brand of psychedelia. There are about 8 members, both female and male vocals, always light and airy… like some kind of cosmic head massage. Instrumentation is primarily acoustic (strings, flute, percussion), but electric guitar subtly and happily coexists with the general acoustic tribal setting. The music is song based, but tracks like "Ibex Horn" demonstrate how the band can launch into acid-psych jam territory. And there's a dissonance that crops up from time to time, which gives the music a slightly experimental feel, while at all times retaining it's spellbinding psychedelic allure. This is best exemplified by "van Bal", which in its strange way invokes the avant-prog of bands like the Art Bears, but gone completely hippie psychedelic. But "van Bal", and the next song, "Silverleaves in the Air of Starseedlings", also recall early 70's progressive rock as it traverses through a variety of ever changing themes… though again… we're totally in mind expanding magic carpet ride folk-psych territory. In short, this is one of the most enchanting albums I've heard yet this year. Not since Fit & Limo have I heard folk-psych as adventurous as what Feathers is creating. HIGHEST recommendation. For more information you can visit the Feathers Family web site at: http://www.feathersfamily.org.